It’s starting to feel like fall this week. Seemingly out of nowhere, yellow leaves are flying past me as I drive around. It’s getting noticeably darker – noticeably earlier. And corn and tomatoes are giving way to apples and pumpkins. 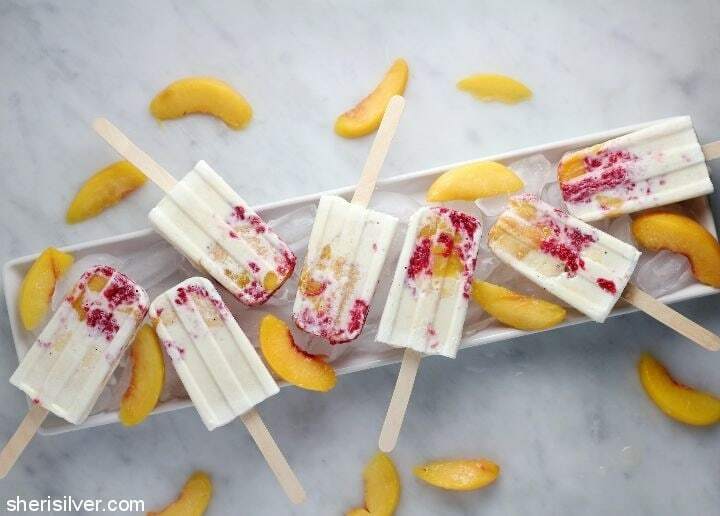 But it’s still warm, I’m not quite ready yet, and these pops are proof that you can have a taste of summer any time! Peach Melba is a classic, old-fashioned dessert, traditionally served as a bowl of vanilla ice cream topped with peaches and pureed raspberries (the “Melba” sauce). 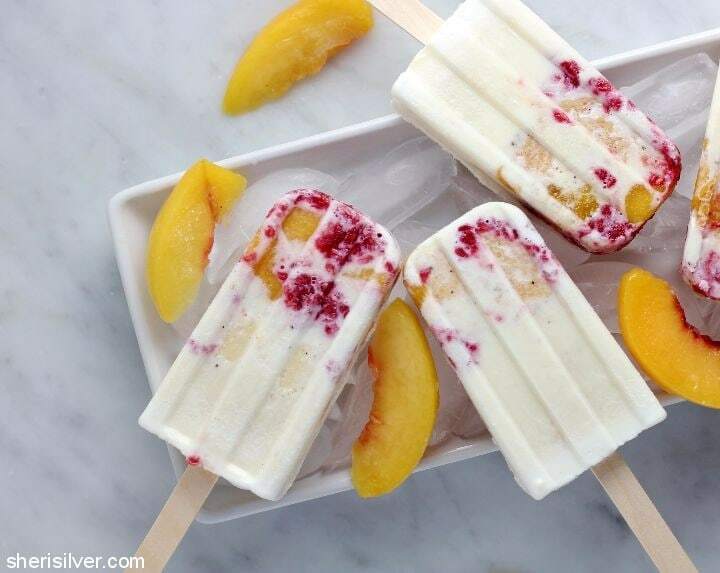 And while you’d want to make this dish with the freshest, in-season fruit you could find, for a popsicle it works just as well with frozen fruit. Even better, IMO, as there is less prep. For this recipe I started with good vanilla ice cream, as opposed to the “from-scratch” base I tend to make for pops. I wanted the flavors to most closely replicate that of the traditional dessert, and ice cream was the way to go. 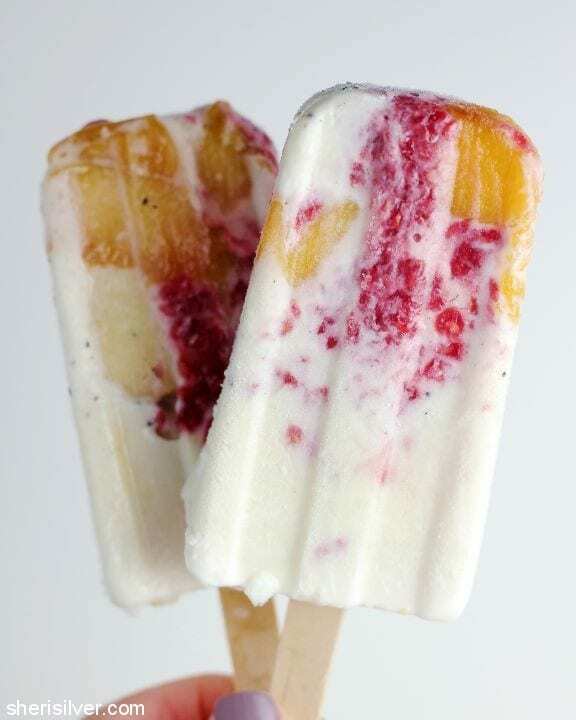 I cooked down some frozen peaches to make them softer and easier to eat in the popsicles, and I cooked the raspberries down to create the sauce. Anyone knows me will attest to my “bajillion to one” toppings to froyo ratio, and that I love ALL the mix-ins. 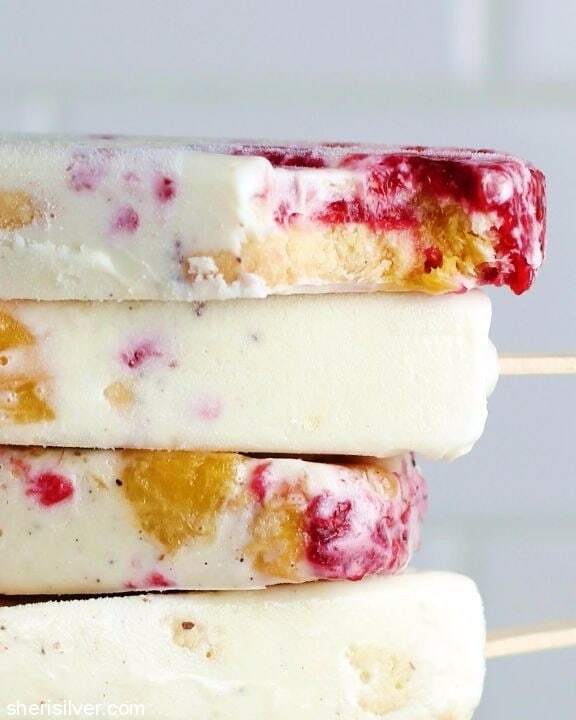 And when I look at my favorite popsicles over the last few years they all have some kind of candy, cookie or cereal folded in. As I like to include an assortment of cookies whenever I serve ice cream (or just sandwich the ice cream BETWEEN two cookies), I knew the direction I wanted to take. And I knew that crisp, buttery shortbread would go perfectly. I used my fave shortbread recipe, minus the mix-ins and with a sprinkling of flaky sea salt. Make them now, make them in the dead of winter, make them! Combine peaches and 2 tablespoons of honey in a small saucepan and place over medium-high heat till bubbly. Reduce to a simmer and cook – stirring often – for about 10 minutes. Transfer to a bowl and let cool. Wipe out the saucepan. Combine the raspberries and 2 tablespoons of sugar in the same saucepan and repeat as above; let cool. Soften the ice cream till still cold but “stirrable” – place a bit in the bottoms of each of your popsicle molds. 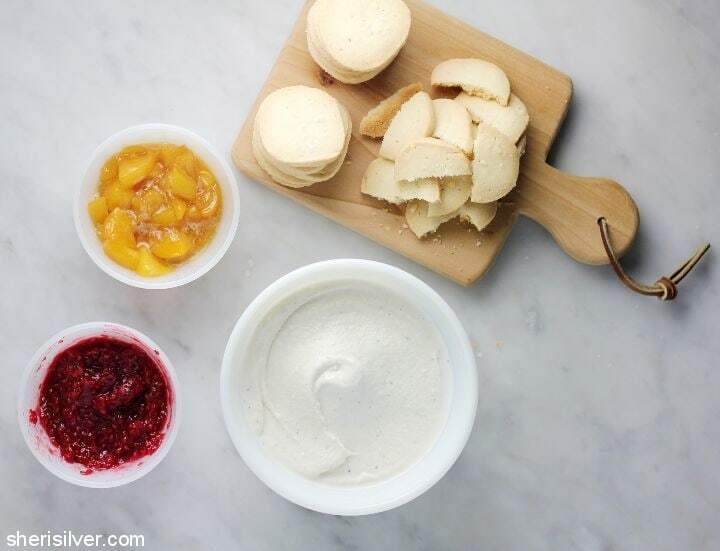 Follow with some of the peaches and raspberries. Repeat layering till molds are 3/4 filled. Place a few cookie halves into each mold. 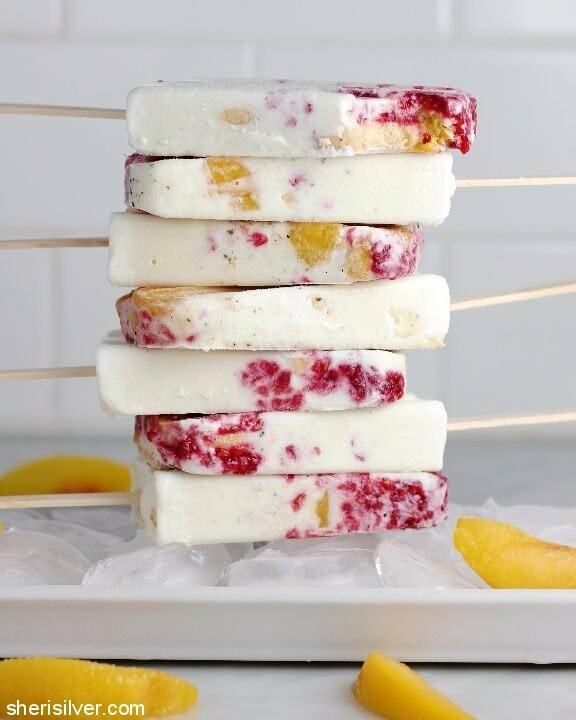 Add sticks and freeze overnight. For the shortbread, I adapted the recipe in the link as follows: I omitted the mix-ins and topped each cookie with some flaky sea salt prior to baking. I bumped the oven temp up to 300 and baked till crisp and golden brown around the edges, about 15 minutes. I only used half the log (and froze the other half for later use), and still had plenty of cookies left over.